TheraStim is extremely versatile with applications across a wide range of neuromuscular, musculoskeletal and pre and post-surgery conditions. These conditions include bursitis, sprains, strains, rotator cuff inflammation, deep hip injuries, headaches, lumbar scoliosis, and whiplash. TheraStim features a blend of two signals: a main pulse and background signal. 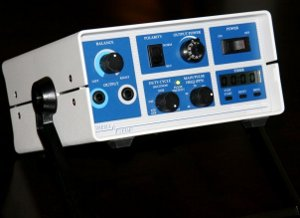 The unique signal provides a “3-D” stimulation of the body area being treated. Patient participation is another feature of the treatment system, resulting in self-directed therapy. Electrostimulation therapy has been found to be beneficial for a variety of conditions. Contact us today for a free consultation. Call us at 816-373-3373, chat with us live online, or fill out an online appointment form today.